"A Community Land Trust is a mechanism for the democratic ownership of land by the local community. Land is taken out of the market and separated from its productive use so that the impact of land appreciation is removed, therefore enabling long-term affordable and sustainable local development." 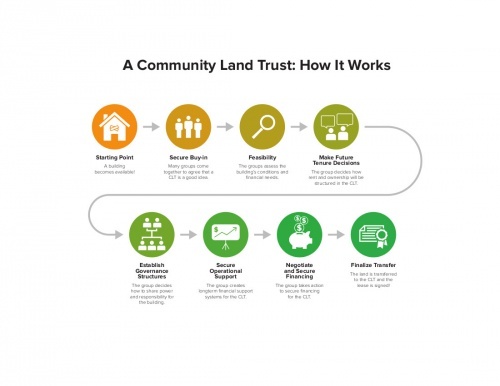 "Community Land Trusts provide a multi-stakeholder decision-making forum similar to adaptive comanagement systems. It also removes land from the market, reinterpreting land as a community legacy rather than a speculative commodity." "Since 1987, the number of CLTs in North America has tripled—and today, there are roughly 200 non-profit organizations holding title to land and sometimes buildings, ideally forever. CLT property holders then hold title to anything from the ground up – whether crops, individual condos, houses, or entire buildings. Property holders can be homeowners, renters, cooperatives, businesses, charities, affordable rental hosing providers, or other community organizations. Consequently CLT homes were able to securely house low- to moderate-income households when markets in the US were hot—and these homes turned out to be largely immune to the sub-prime collapse. CLTs operate in all types of spaces, communities, and architectures in the US and underlie residential, commercial, and community spaces, housing people with a wide range of incomes. But the really interesting part of CLTs is their board structure, which tells us a lot about creating resilient and equitable urban futures. The board is made up of three equal parts. One third is elected from CLT residents: anyone living in a CLT home. Another third is elected from non-resident members: anyone who is a paid member of the CLT but not a CLT resident, and each CLT draws its membership from the neighborhoods, cities, or counties that it serves. The last third is appointed by the first two thirds and is drawn from public interest representatives such as planners, architects, banks, credit unions, local or state government, funding agencies, local businesses, chambers of commerce, charities, and so on. This board structure has been developed through trial and error over the past few decades, with the aim of combining and balancing multiple interests on the board. It’s a stroke of genius, really: the creation of an ongoing forum where stakeholders operating at different scales and with differing perspectives have to regularly meet and steward diverse parcels of property that have no speculative base. This board structure has driven CLTs to broaden their activities and develop programs in response to local need, ambition, and opportunity. For example, a CLT may become aware of a local food security issue and so offer a property to a food pantry at a discounted rent, or it may become aware of a derelict downtown, so focus on building employment spaces and affordable housing in the area. "CLTs range in size, can be rural or urban, and provide a variety of housing tenures as well as other community facilities, including workspaces, energy generation, community food and farming. (i) Community-controlled and community-owned: A CLT is set up by the community and for the community. The members of the CLT control the trust, and the assets can only be sold or developed in a manner that benefits the local community. If the CLT decides to sell the asset, the funds realized are protected by an asset lock and are re-invested into something which the trust's members think will benefit the local community. (ii) Open democratic structure: People who live and work in the defined local community, including occupiers of the properties that the CLT owns, must have the opportunity to become members of the CLT. The CLT should actively engage members of the community in its work and ensure that they remain engaged in the development and operation of the CLT. (iii) Permanently affordable housing or other assets: This is a crucial defining feature of a CLT. A CLT will endeavor to keep the homes or assets permanently affordable. (iv) Not for profit: All CLTs are not for profit and any profits generated by the CLT cannot be paid by way of dividend or otherwise to its members, but must be used to further the community's interests. "The CLT model has been imported from the United States where it grew out of the civil rights' movement. The largest CLT in the US now has more than 2,000 homes. In England and Wales, more than 170 CLTs have already been established; but all but 25 are in rural areas, from Cornwall to the remote Holy Island of Lindisfarne. The barriers to urban CLTs are much higher because of the difficulty of acquiring land in high value areas, a lack of capacity, and competition from existing providers; homes can be lost to the open market and not retained as affordable housing. "Community Land Trusts (CLTs) are a unique commons-based form of property rights. Instead of the usual arrangements where individual property-owners hold all the rights or where corporate property-owners are legally accountable to shareholders, land trusts are “owned” by a board of “trustees” who are legally accountable to whoever has been defined in the trust’s charter as its “beneficiaries.” Community Land Trusts were introduced to the U.S. in the 1960s an 1970s by the Institute for Community Economics (ICE), which drew on a variety of established international models, particularly from India. ICE’s idea was that trusts would be governed by their membership, and open both to those who reside on the particular land and to other members of the local community. In most CLT arrangements residents own the house where they live, and can accumulate a modest amount of property value through improvements they’ve made to the land and house when they sell it. But they cannot profit from the real-estate value of the land itself, which remains in the ownership of the trust. The model has stood up well as way to stabilize affordable housing for low- to moderate-income people (although not for the lowest-income people). The positive results of removing property from the volatility of the real estate market can be seen in the Dudley Street neighborhood of Roxbury in Boston, where a powerful community organization in 1988 turned many vacant lots into a CLT. “Four hundred new homes occupy once-weed-strewn lots; small businesses thrive; a greenhouse grows organic produce for local restaurants; parks and playgrounds have been rebuilt; and next door a $100 million community center is underway. Home prices in this section of Roxbury are as much as 10 times higher than when the Dudley Street Neighborhood Initiative formed in 1984. The housing in the trust, however, remains available to the next nurse, teacher, or bank teller who wants to stay in the community,” wrote David Abramowitz and Roz Greenstein in the Boston Globe. The CLT model has been more widely adopted in rural settings than cities, to protect land from development (a model used by the Nature Conservancy) or to preserve land for farming. But there are increasing examples of urban CLTs designed to allow low-income families to become first-time homeowners. Typically, a CLT involves a 99-year lease of the land, which is inheritable just like regular real estate property and which can be renewed on the same terms when it expires. Each housing CLT lays out a formula to determine how much equity residents can acquire, which determines how much money sellers of CLT homes receive from the sale; usually this formula is based primarily on how many years they have been in the home and what improvements they have made to the property. The amount of money they get is naturally much smaller than would be the case for a conventional, private home-owner whose home’s real-estate value has appreciated. One of the great strengths of the CLT model is that trustees are legally bound to show “undivided loyalty” to the trust’s beneficiaries. Just as a corporate executive who fails to act in good faith to maximize profits has violated the terms of his employment, a trustee who fails to act in good faith to protect the land, ensure affordability for CLT residents, or fulfill any other duty to beneficiaries stipulated in the terms of the trust can he held legally accountable for this failure. One promising example of an urban CLT is the Figueroa Corridor CLT in Los Angeles. The land trust emerged out of Strategic Actions for a Just Economy (SAJE), a community organizing group that is another founding member of the Right to the City alliance. SAJE and a coalition of other groups negotiated a Community Benefits Agreement (a powerful tool in which developers agree to provide a community with certain benefits in exchange for the right to undertake a development in that community) with the Staples Center,which was planning a huge development in the Figueroa Corridor. They secured $5 million for affordable housing from the developers. The developers, however, did not want to be involved in providing the affordable housing; they preferred to grant the $5 million as seed money to a non-profit group, which was how the Figueroa Corridor CLT (FCCLT) was created. This idea raises very interesting possibilities. Could a CLT with a strong interest in promoting community-owned small businesses and no financial interest in the property value of the land they lease– simply because it’s a land trust – lower overhead costs for community-owned businesses to make them more competitive? Could a model be developed where a successful commercial district on CLT land generates lease revenues that continuously fund expansion of the CLT, including the creation of more affordable housing? There seems no reason – besides the huge challenges of securing funding– why commercial, and even industrial, land uses cannot be incorporated into the CLT model. Organizations seeking to create a CLT face one large obstacle: finding funds to buy the land in the first place. This greatly limits the reach and usefulness of this strategy for protecting urban neighborhoods from the forces of gentrification and foreclosure. Still, some poor urban community organizations have succeeded in piecing together the necessary funding from foundations and individuals. And the experience of the Figueroa Corridor CLT suggests another approach: making funding for CLTs part of Community Benefits Agreements negotiated with developers. Another potential source of funding for CLTs is local, state and federal government. A number of different matching-grant, subsidy, or tax-break policies could be developed – or extended beyond their current modest levels – to help community organizations form CLTs and acquire land. Local governments could also do what the city of Boston chose to do in the late 1980s when it granted the non-profit Dudley Street Neighborhood Initiative eminent domain rights to claim vacant lots for redevelopment. With that level of city support – or even just a few sizable matching grants – the funding challenges of creating a CLT may not look quite as daunting.
" the growth of the CLT movement has been restrained by an acquisition problem which has so far impeded them to reach a greater scale and become a vector for change. Apart from the United States where the development of large urban CLTs is currently underway, most other countries are still mainly developing rural CLTs at a small and marginal scale. Due to their significant financial requirements (to acquire land, develop housing (and other buildings), create affordability, and sustain their operations), the expansion of both rural and urban CLTs has undoubtedly been restrained by a limited access to low-cost finance. Yet it would be a mistake to believe that the expansion of the movement has only been muted due to financial limitations. The crux of the problem is above all political. If anything, the outcome of the Bhoodan (Land Gift) and Gramdan (Village Gift) movements have indeed shown us that the access to land is not the only obstacle faced by land reformers. Before, during and after the land is acquired, a number of non-financial conditions are indeed required to be met in order for alternative forms of tenure such as the CLTs to be able to secure their transformative potential. Among others, these include: (i) their recognition by public officials and the establishment of a favorable legislation, (ii) an external communication which is clearer, more consistent and more accessible in order to reach out to a larger audience and be more attractive, (iii) a greater community engagement, and (iv) coordination and collaboration with other movements who have similar aims (i.e. co-operatives, social enterprises, etc.). The CLT movement needs to deal with a multitude of parts which interact with each other in multiple ways. It is faced with a complex problem which requires the focused and collaborative participation of the different parts involved. And it should therefore not come as a surprise that the single most important factor which can enable the movement to scale up and secure its transformative potential has been found to be the advancement of social-public partnerships involving a number of committed and cooperative partners such as municipal authorities, affordable housing developers, the co-operative sector, local government, mission-related social investors and active citizen groups, at both the national and the local levels. For John Emmeus Davis, the take off of the movement over the past decade has indeed been fueled by a dramatic increase in local government investment and involvement with the leading edge of CLT formation in the United States being municipally sponsored community land trusts. For Pat Conaty, highly successful community-led economic development such as Coin Street Community Builders in London and the Champlain Housing Trust in Burlington, Vermont, have succeeded because of creative multi-stakeholder partnerships between civil society groups, supportive local authorities and other urban anchor institutions. "In 1986 in my own Jug End Road neighborhood of the Berkshires region of western Massachusetts, Robyn Van En founded the first Community Supported Agriculture (CSA) project in the United States at her Indian Line Farm. In a CSA, consumers guarantee the yearly production costs of the farmer through a shareholder fee. Working in collaboration with shareholders, the farmer determines an annual operating budget. Ideally, the budget is then divided by the number of shareholders to determine the cost per share. CSA members pay in advance so that funds are available to the farmer during the growing season. In return they receive a weekly share of the harvest and the security of a local source of organically raised vegetables. Because of Robyn’s initiative there are now over a thousand CSA farms around the country. CSAs provide an excellent model for consumers sharing the risk of yearly production costs with the farmer. Yet the question remains: how can young farmers gain affordable access to land in the first place? Again Indian Line Farm provided a model. When Robyn’s farm came up for sale following her untimely death in 1997, the sale price was too high for entering farmers. A farm income alone could not carry mortgage payments and still maintain responsible farm practices. It was the cost of the land that put purchase price out of reach. This problem is typical of regions close to urban areas or deemed valuable for vacation homes. The market value of the land reflects the demand for house sites, frequently second-home sites, rather than the social benefit of maintaining a local farm. High purchase costs of the land and the pressure of mortgage payments on that purchase can drive a farmer to employ unwise farm practices and production methods beyond what is ecologically suitable for the land. If the citizens of the Southern Berkshires wanted Indian Line to remain an active farm producing vegetables for local sale, they would have to partner with the farmer to purchase the farm. The community, working through the Community Land Trust in the Southern Berkshires and The Berkshire Taconic Landscape Program of The Nature Conservancy, made a one-time donation to purchase the land. The Community Land Trust holds title to the land, and The Nature Conservancy holds a conservation restriction. This has enabled two young farmers, Elizabeth Keen and Alexander Thorp, to purchase the buildings and enter into a ninety-nine-year lease on the land, the use of which is determined by a detailed land use plan. The individuals who donated to the project needed the incentive of knowing that the Community Land Trust and The Nature Conservancy would not be coming back next year to the donors to refinance the same farm—that this one donation would keep the farm actively farmed and affordable for future farmers. Ownership, after all, is only a bundle of rights. It was simply a question of what rights the donors, working through the two non-profits, wanted to retain in return for their role in purchasing the land; put another way, how many rights would the farmers require to preserve the incentive to farm with all their heart and strength? The buildings are to remain owner occupied. They cannot become rental property or vacation homes for city people. The land must in fact be farmed. The lease requires a minimum yearly commercial crop production over and above household use; however, the lease does not specify what kind of crops should be grown. This is the private affair of the farmer, based on his/her evaluation of local markets. At resale the buildings must remain affordable to the next farmer. The lease requires the leaseholder to offer all buildings and other improvements back to the community land trust for resale. The price can be no more than the current replacement cost of the buildings, adjusted for deterioration. The farmer is to employ organic practices and meet the conditions of a land use plan developed to respect the specific ecology of the site. All other ownership rights belong to the farmer, including the ability to pass on the farm to heirs through the transfer of the lease. The lease arrangement does not guarantee that the farmer will farm well. Such skills are cultural and acquired over many years; however, by taking away the burden of land debt, the community land trust does give farmers the opportunity to ply their craft under more favorable circumstances. As land prices continue to rise in regions surrounding cities, it will be ever more important for citizens to utilize such enabling methods to ensure a local food supply. The basic achievement of the community land trust legal documentation is to separate the value of the land from the value of buildings and other improvements on the land (fences, soil fertility, perennial stock, etc.). Land, a limited natural resource, is removed from the market and held in trust by the democratically structured, regional non-profit. The value created from labor applied to the land (agricultural crops, buildings, etc.) is securely the private equity of the person creating the value (the farmer) and is exchangeable in the marketplace. "The development of a community land trust (CLT) in Puerto Rico might be a pretty good story by itself. What makes it an extraordinary story is that the organizing activity that led to the formation of the Caño Martín Peña Land Trust was started by the Puerto Rico Highway Department. Caño Martín Peña was once a navigable waterway through the center of San Juan, connecting two lagoons. Impoverished squatters who migrated to San Juan from rural areas during the first half of the 20th century settled along the Caño and built their houses among mangroves. Over time, the Caño (canal) closed in with debris and waste. Over 3,000 structures were located where there was no sewer system, contributing to environmental degradation and hazardous health conditions when flooding occurred every time it rained. With a plan to dredge the Caño in the works, the highway department embarked upon a new strategy to engage the poor communities that would be most affected. Department leaders did this as a result of very bad experiences with several projects where community opposition effectively stopped progress. Between 2002 and 2004, highway employees enlisted leadership among the eight poor communities (20,000 residents) that border the Caño and engaged in over 700 meetings and activities, which resulted in a Comprehensive Development Plan and Land Use Plan for the area. At a recent presentation, some community leaders were crystal clear about their motivation to participate: they wanted to protect their right to relocate within the area rather than allow gentrification to push them out of the 200 acres that would be upgraded as a result of the dredging. While the communities affected are among the poorest in Puerto Rico, their employment level is higher than the average. The CLT is a tool for economic development that benefits the residents as it provides for tenure on the land. In 2004, a law was passed creating two bodies that would implement the plans: ENLACE Corporation (the administrative body) and the Caño Martín Peña Community Land Trust (CMP-CLT). The CMP-CLT was a new threshold in Puerto Rican public policy, transferring over 200 acres of public land next to the “Golden Mile” (San Juan's financial district) to a trust held by the residents. Over the next two years another participatory process engaged all the residents in establishing the regulations that govern the land trust and the rights of the residents with regard to holding or transferring their property. Despite support voiced by the newly elected governor during the electoral process, in 2009 the mayor of San Juan and the governor got legislation passed that transferred the land back to the municipality of San Juan and enables the municipality to grant individual land ownership to the residents, eliminating the Land Trust and creating divisive incentives within the community. This action was consistent with the potential for gentrification, as individuals will have incentive to sell to the highest bidders, which the Land Trust had prevented. The CMP-CLT, backed by the G-8 (group of eight communities), sued the government, and the government has countersued. "In Kenya, land tenure issues are of high priority because precolonial methods of land tenure were more community-based than present day legal structures, which has led to serious conflicts over land rights. The Bondeni Community Land Trust was founded in the 1980s as a way to address the complex problem of urban settlements within smaller towns in Kenya. The implementation plan received substantial input from the community thanks to sustained mobilization by local residents who were determined to stay informed and involved in the process. Residents were identified, registered, and their needs discussed and prioritized, after which a committee was formed to represent them. 60% of households in the settlements own their housing structures, 30% are tenants and 10% of tenants live with the structures’ owners. The land is held by the community, but the local municipal council provides training and technical support for laying out sewerage and water pipes as well as an office for the residents’ committee. Residents own any developments on their own plots of land and can bequeath, inherit or sell them back to the CLT according to a specific resale formula. The Bondeni Community Land Trust was funded by central government loans and a German institution, and was built on land donated by the municipal government. There are two main bodies that govern the CLT: the “society,” which is in charge of the day-to-day matters of the community-based organization, and the “trustees,” who are concerned with administrative matters such as issuing leases, determining fees for land rental, and making land use decisions. "In Liverpool’s Anfield neighbourhood, a community bakery is the symbol of economic empowerment: renovated and run by the Homebaked Community Land Trust established in April 2012, the bakery – initially backed by the Liverpool Biennale – offers employment opportunities for locals, and it is the catalyst of local commerce and the centre of an affordable housing project that is developed in the adjacent parcels. Similarly, a few kilometres east, local residents established another CLT to save the Toxteth neighborhood from demolition. The Granby Four Streets Community Land Trust, with the help of social investors and a young collective of architects (winning the prestigious Turner prize), organised a scheme that includes affordable housing, community-run public facilities and shops. Book: The Community Land Trust. E.F. Schumacher Institute. This page was last modified on 2 September 2017, at 08:15.